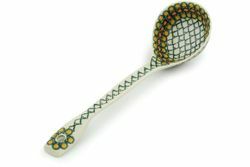 Home > ACCESSORIES > Ladles 13"
Soup Ladle. Polish Pottery Ladle is a great addition to your tureen. It is beautiful enough to bring to the table or hang on the wall of your kitchen. Clean up is easy, hand wash or toss it in the dishwasher. All our Soup Ladles are handmade and hand painted. This stoneware ladle is hand crafted at famous Ceramika Artystyczna factory, Poland.